Japan intrigues me. Years ago I bought a travel journal about Japan and I dream of travelling through Japan. Unlike most people, I don’t care for the landscape or famous old temples or buildings. It’s all about the people who are different from us in so many ways. I would love to visit ordinary people and see how they live and work. Of course I would also like to visit a real Japanese fountain pen shop. In my dreams, all the beautiful and special pens from Japan are on display there. Pens that are made with so much craftsmanship and love with a personal touch for anyone who wants to. 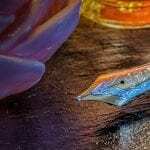 And even better, I would like to visit a fountain pen factory and get to know the true masters who are trained in the high arts of Japanese lacquers. Such as Maki-e, Urushi or Aka Tamenuri. Things that people make tell a lot about the makers. 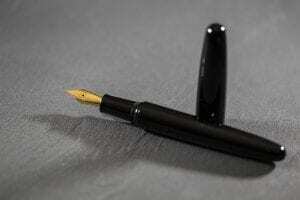 If you give me a fountain pen I can list the properties of the people who made it. 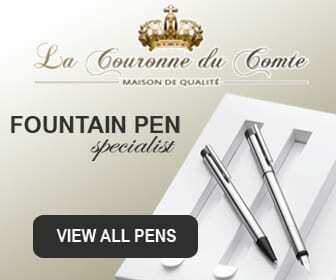 Out of the blue we received an email from Japan asking us if we would like to review a new Japanese fountain pen. We don’t need to think long about that. Of course we would like that! The next e-mail was accompanied by a personal video lasting six minutes about how they liked us to write something about their new pen and about Wancher’s corporate philosophy and the thought behind the Dream Fountain Pen. Wancher wants to make the fantastic beautiful fountain pens from Japan accessible to more people. Yes! According to Wancher, traditional fountain pens are too expensive due to high advertising and marketing budgets. 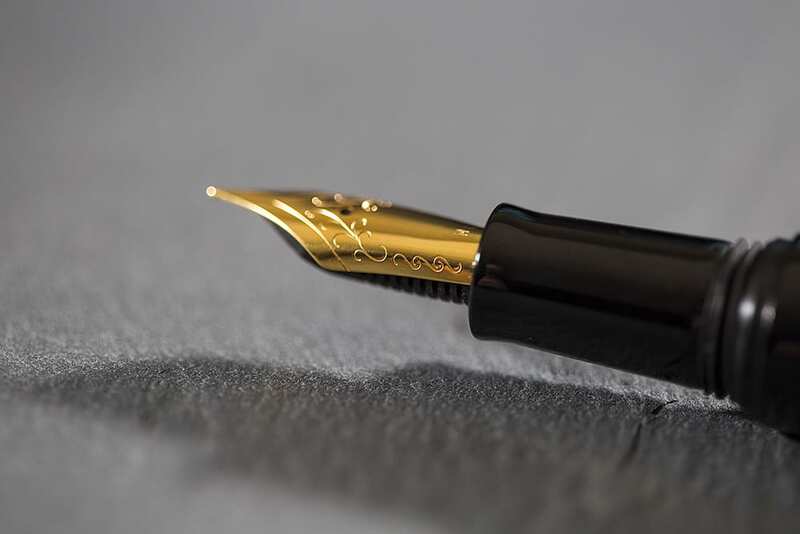 By working together with the fountain pen enthusiasts community, Wancher wants to make fountain pens that match our wishes and become well-known without having to run expensive advertising campaigns. I want to declare the people of Wancher to be honest friends of the fountain pen community. On top of that they also asked if we wanted to be honest about their pen because they can learn from it. The Wancher Dream Fountain Pen that we have received on loan is a prototype and will not end up in the stores. It reminds me a little bit of a slightly smaller Namiki Emperor. Our sample copy is in black and has no clip. The pen looks great. The black paint on the ebonite is beautiful and gives the pen a typical Japanese look, simplicity combined with perfection. 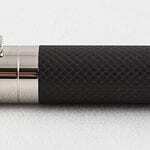 If Wancher succeeds in bringing this pen to the market starting from $200, it will certainly be a success. The Wancher Dream Fountain Pen will also be available in other colours, such as blue and red. I myself am very interested in the Tamenuri version. I can’t stress enough to our Japanese friends that more colours will lead to more turnover. The Wancher Dream Fountain Pen writes excellent. We have a pen with a Jowo nib from Germany. You will not hear any complaints about these nib from us. The gold plated steel nib works above expectations and meets all my writing tests that I try out on all fountain pens that I test. A 14 or 18 carat gold nib will be even better and more flexible, so that’s fine. We don’t really understand why Wancher chose a nib from Germany. Is it a question of price? Usually we are very positive about the nibs from Japan, especially the soft nibs from Pilot are great. Or do the Japanese manufacturers not supply Wancher because they do not want to help a competitor? That could be an option. The Wancher Dream Fountain Pen is quite large and massive, but very light. It is bigger than a Duofold and a Pelikan 800. Because the nib holder is not too thick, the grip is fine. The transition from section to barrel is quite large. Now I really have to be honest with my new Japanese friends. For a cap that is larger than the barrel, I would choose to make the transition between section and barrel smaller. This so your fingers don’t have to deal with a sharp transition. Look at the major fountain pens in history, no classical fountain pen has a large transition between these two parts. An additional advantage of this is that you can also put the cap on the back side while writing. With the prototype fountain pen we have been given, that is not possible. I’m curious to know what the Wancher Dream Fountain Pen will look like when it’s in store. Anyway, it remains a miracle if we can buy a Japanese fountain pen with the lacquer made by a Japanese Urushi Master for 200-300 dollars. Pretty cool. Not cheap though, and while I value the project I’ve vowed to stop using kickstarter after being disappointed too many times.